Deputy Attorney General Rod Rosenstein and U.S. President Donald Trump are heading to the police chiefs’ conference in Florida on Monday. The two men, who have a tense political relationship, will make the flight together, aboard Air Force One. Rosenstein and Trump were supposed to hold an extensive meeting weeks ago but delayed their talks as SCOTUS Justice Brett Kavanaugh was waiting to be confirmed by GOP members of Congress. 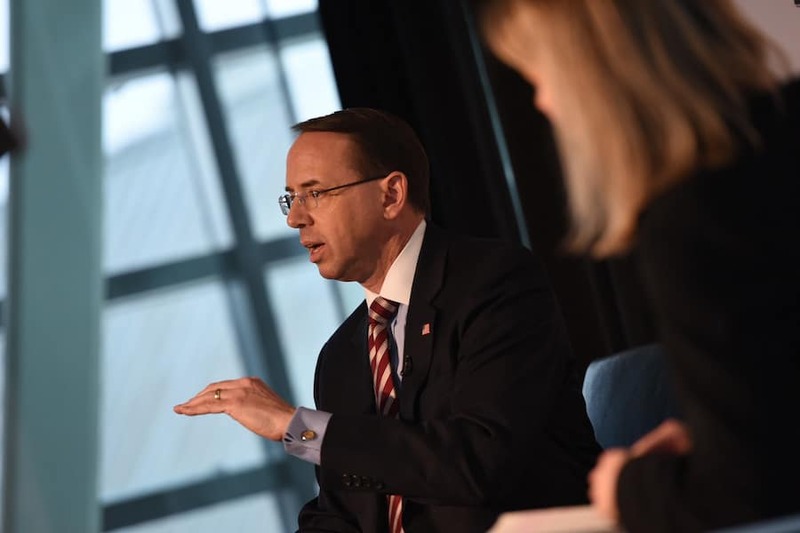 Rosenstein recently came under fire for alleged conversations he had in which the Deputy Attorney General reportedly said he wanted to record conversations with Trump and work on enacting the 25th Amendment to have Trump removed from office. Rumors have circulated in recent weeks that Rosenstein may resign from his post or be fired by President Trump. It was reported that Rosenstein originally met with Trump at the White House after he told Chief of Staff John Kelly that he was ready to step down. In a public address, Trump said he would prefer not to fire Rosenstein. The Deputy Attorney General also told Trump that he did not claim to be quitting his position nor did he expect the President to fire him. Further, it’s unlikely the President would risk firing Rosenstein, who oversees Robert Mueller, just weeks before the 2018 mid-term elections. Doing so could throw the GOP into further chaos and cause the Republicans to lose the House and Senate. While President Trump has most certainly criticized the FBI’s Special Counsel investigation, he has reserved most of his remarks for Attorney General Jeff Sessions. It was Sessions who recused himself from the Special Counsel investigation after it was determined he had contact with Russian officials during the time of the Trump campaign. It’s not clear at this time what President Trump and Rod Rosenstein will discuss, although House Republicans have also requested that Rosenstein answer questions regarding the alleged comments he made about the President. In the meantime, we are going to be paying close attention to Trump’s speech at today’s Police Chiefs’ Conference. It could be a good cursory examination of how well his conversation with Rosenstein had gone on Air Force One.